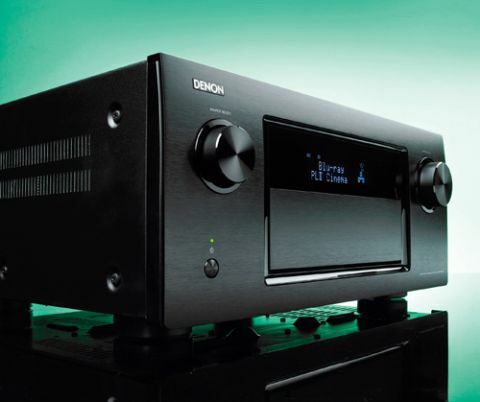 Denon AVR-4520 review | What Hi-Fi? The AVR-4520 is Denon's top-of-the-range AV receiver - and it's an impressive statement from a company with arguably unrivalled pedigree in this market. Denon has led the way at every price level at one time or another in recent years – and the 4520 will be doing its best to regain the top spot and revive Denon's glory days in the £2000 arena. Heaved on to our AV rack, it has formidable presence. There isn't a huge amount of variation when it comes to design in this market, but the Denon is a little lower to the ground than rivals and stands a touch taller. Big and heavy comes as standard, but it looks smart and has a real premium feel. The exhaustingly comprehensive spec list is every bit as formidable, too. A 9.2-channel AV receiver with support for height and width channels, the 4520 pumps out 150W per channel (into 8 ohms). There are seven HDMI inputs (one on the front) and three outputs, plus plentiful further audio and video inputs. There's also 1080p and 4K video upscaling, plus 3D support on-board. It's DLNA compatible, too, and will stream 24-bit/192kHz FLAC files. There are also free Android and iOS remote control apps that make typing text to search for internet radio stations, podcasts or Spotify far faster. A clever series of on-screen menus walks you through the set-up process, and the now-standard auto set-up system proves accurate. The latest Audyssey room EQ option is here too, though we prefer the processing off for our room. So it is that we dive in to the DTS-HD Master Audio soundtrack of Avengers Assemble. It's a very easy-to-listen-to sound, a cohesive, solid performance with no harsh edges, albeit not quite with the scale of the very best. Effects are steered confidently around the room while dialogue is clear and engaging. Explosions extend the subwoofer and with this Denon in charge bass notes are solid and powerful. However, the comfortable nature of the AVR-4520 also proves a minor weakness over time: soundtracks don't have the attack and punch of some rivals, which compromises excitement. A listen to some stereo music yields largely good news thanks to good detail and timing but, again, you'll get a more exciting sound from others. There's a huge amount to enjoy here. An exhaustive spec gives you everything you'd expect in an AV receiver and much more, coupled with a cohesive, engaging and easy-to-enjoy character. Only a little excitement and scale is missing compared with its peers.